(CNA/EWTN News) Jesus’ miraculous multiplication of the loaves and fishes is a lesson for us all, Pope Francis said Wednesday. The Pope reflected on the miracle of Jesus’ feeding of 5,000 people as recounted in the Gospel of Matthew, saying that the miracle offered a lesson for Christ’s disciples. The pontiff summarized the gospel account in his catechesis at the weekly General Audience in the Paul VI Hall August 16. The story in the Gospel of Matthew “clearly evokes” the institution of the Eucharist at the Last Supper, the Pope said. 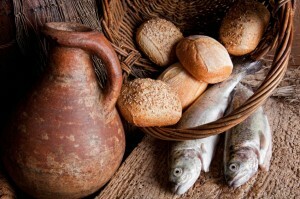 Jesus lifts his eyes to heaven, says the blessing, breaks the bread and gives it. “Through our partaking of the Eucharist, we not only receive spiritual nourishment but, conformed ever more fully to the Lord, we become signs of his merciful presence to those around us,” the Pope continued. He prayed that God might make Christians become “instruments of communion” in their own relationships. “May all of us, as members of Christ’s body, seek to bring to our families and communities, and especially to those most in need, the nourishment of God’s closeness, mercy and love,” he concluded.